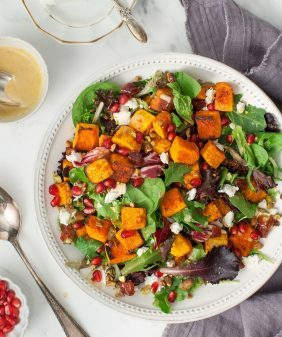 A delicious fall salad made with roasted pumpkin or butternut squash, pomegranate, pepitas, and blood orange vinaigrette. A great Thanksgiving side. Are you sugared out yet? Since I already posted my one and only candy idea, I wasn’t quite sure what to make for today. I was going to skip this holiday post altogether until Jack came up with the genius thematic idea to make something with black forbidden rice. I had a pumpkin sitting on my countertop as well as some blood oranges… so naturally, I came up with the ultimate Halloween salad for this L&L Spook-tacular post. (That’s what Jack is calling it). I made a blood orange vinaigrette spiced with cumin, coriander, and a bit of cinnamon. I just love how the warm spices bring out the natural sweetness of the roasted pumpkin. (Of course, if you don’t feel like tackling a pumpkin, feel free to use butternut squash cubes instead). Pomegranates worked well into my bloody little theme here, but they’re also a perfect pop of flavor with the orange. The salad is finished with toasted pumpkin seeds and feta cheese – a super flavorful combination to hopefully offset your candy-induced sugar rush. I hope you all have a happy & healthy Halloween weekend! Toss cubed pumpkin/squash with a bit of olive oil, salt & pepper. Spread on a baking sheet and roast until golden brown around the edges (25-30 mins depending on your squash). 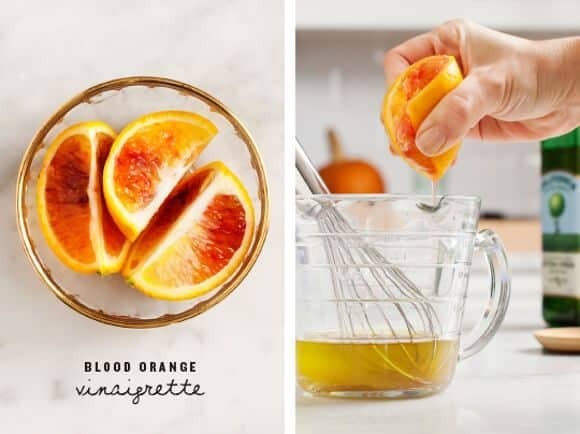 Make your vinaigrette by whisking together the olive oil, apple cider vinegar, blood orange juice, cumin, coriander, cinnamon, salt, and pepper. Taste and adjust seasonings. 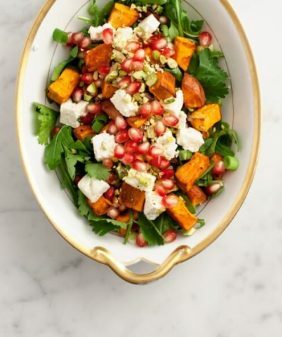 Toss the cooked rice with the roasted pumpkin cubes, salad greens, dressing (as much or little as you like), pomegranate seeds, feta, and pepitas. Taste and adjust seasonings & serve. cook rice: ½ cup rice to 1 cup water. (I use a rice cooker on the brown rice setting). Add more water if it evaporates and the rice is not yet soft. I buy my black rice in the bulk section of my Whole Foods or Wheatsville Coop. 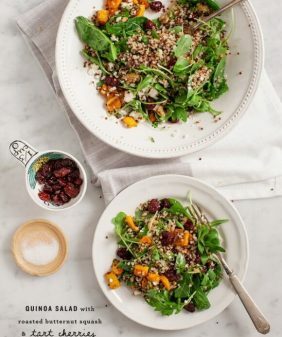 If you can't find black rice, sub in quinoa (you can even get black quinoa if you're going for color). Regular oranges can be substituted for blood oranges. I’m certainly sugared out. Whew. This salad is really speaking to me right now. Love the spooky colors! I have half a butternut squash in my fridge so this is perfect!! The combination of apple cider vinegar, orange and cumin sounds amazing. Thanks for the recipe! 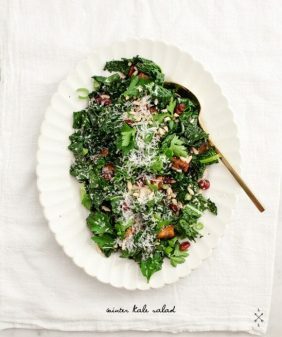 i love the idea of this vinaigrette..and pumpkin with pomegranate is so festive. Oh my word this looks awesome! As soon as I read the title I though “what a clever Halloween post”! So loving the blood orange dressing. Thanks for sharing and Happy Halloween! Thanks for posting a non-candy recipe for the holiday. And that blood orange vinaigrette, wow! Black rice is one of my favorites, and I love platter salads like this – they’re a fun way to serve a group and to fill out a holiday meal spread. This looks so delicious Jeanine! I love pumpkin and the combination with the gorgeous rice and blood orange vinaigrette!?! BLOOD ORANGE!!! Sounds outta this world! Such a stunning recipe. And perfect for fall. Looks delicious! Beautiful combination, and all of the flavours sound like they would really go well together! I’ve never cooked forbidden rice before though – does it take longer to cook? How does the flavour compare to brown rice? “Forbidden rice”? I admit, I had to look this one up. What a beautiful, dramatic salad! Love the blood oranges, too. 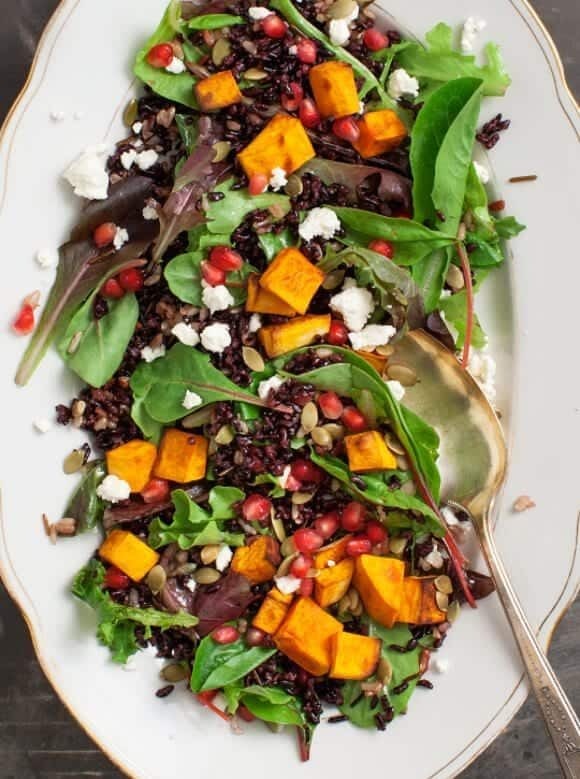 Looks super yum, I’ve always been a fan of black rice, especially if paired with pumpkin and pomegranate! Looks so so good! Looks absolutely delicious. Plus the name – forbidden rice – makes it all the more alluring! This looks amazing! I ate so much candy in the past few days, I definitely need this! This was delicious and will be made again and agin. I’m so glad I found your site! Since I’m attempting vegan, I left out the cheese. Hope you had a lovely Halloween! 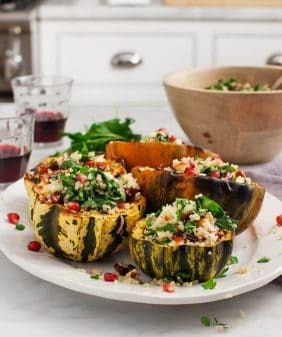 I love your non-traditional spooky recipe – the pumpkin + pomegranate combo is blowing my mind. Can’t wait to give this a whirl! Had this salad yesterday…made for 2, but ended up eating all by myself…too good to share. Delish!!!!!!!! I really like seeing recipes that are specific for vegetarians. 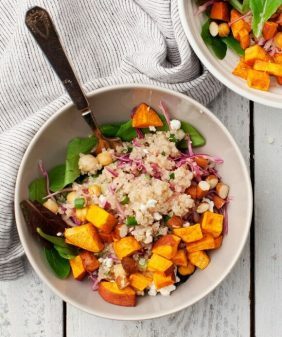 Your recipes is so amazing and I love pumpkin salad! It is one of my favorite cheeses to use in any recipe. I have never tried it before. But your post is interested me, I will make it this weekend for my family.